If you’re looking for a personal trainer in Canberra, it makes sense to go straight to the best. We’ve corralled customer opinions to get an overview of the personal trainers you need to try in this area. What Makes a Good and Reliable Personal Trainer? So, what are we looking for in a personal trainer? They must be able to make a big difference in the lives of their clients. If you can get the same experience from simply going to a gym, then they don’t make the cut! Working one-on-one is an obvious must! Nick isn’t afraid to let everyone know about his talents, which include giving clients “the skills and knowledge to be healthy and fit for their entire lives”. He wants to ensure that his clients will “never need my services again”. You don’t need to just take Nick’s word for it. He offers free trial sessions and is open to answering questions about health, fitness, and nutrition. He takes a holistic approach, which involves reworking the client’s whole lifestyle around their fitness goals. This approach is generally favoured by the best personal trainers as it means progress continues at home. Nick can be reached at nickdelatovic@hotmail.com or on 0423 535 369. Interestingly enough, Nick from ACT was also happy to “personally vouch for the knowledge and skill-base” of Ben, who is recommended by a few reviewers. Ben, they say, “has a large wealth of knowledge and tailors his sessions to meet what you want to work on”. Elements Fitness offers other services such as yoga, MMA, boxing, Capoeira, and other martial arts. Ben can also offer advice on nutrition and other aspects of health as related to your personal training. Ben’s details can be found at Elements Fitness, or you can call him on 0402 581 977. You are also encouraged to drop in to the venue if you wish to speak to them in person. If you would prefer not to go to a gym, Rebecca might be your best choice. She runs her business from her home in O’Malley with a home gym containing a lot of different equipment. Customers who have worked with her in the past say that she provides “true one-on-one personal training” with no need to share her or any of the equipment with other users. This provides great privacy for those who might be shy about working out. She is also flexible enough to allow babies and children to be brought along for the session. Her exercise plans are a “really great experience” and one reviewer says, “she wasn’t cheap but I was happy with her, I thought the vibe and the facilities were great”. She seems to have the knack for letting people understand their needs so they complete their fitness journey both in their sessions and at home. You can find out more about Rebecca at Peak Performance. Our information is all based on user comments, so we appreciate it if you can leave us comments here with your own experiences and reviews of personal trainers in Canberra. These will help us to keep our information up to date and will provide new suggestions for visitors to follow. With these resources, everyone can find a personal trainer they trust! I agree that joining a gym and gaining knowledge is a great place to start, but it can be beneficial to learn from an expert – instead of online – from the outset. It’s very difficult to analyse your own technique, no matter how many books or article you have read. 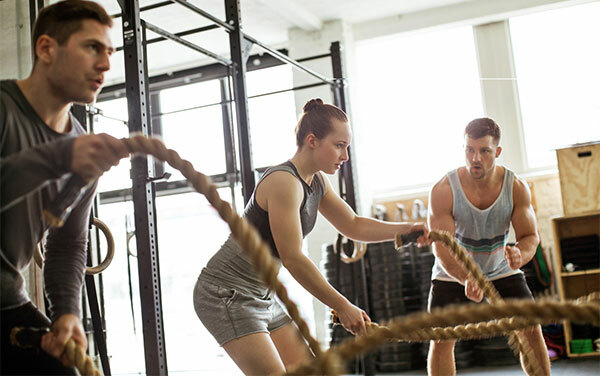 I personally work out of Integrated Fitness & Nutrition in Braddon, but there are a wealth of quality personal trainers here in Canberra at varying price-points. Fyshwick and Mitchell have a huge number of private gyms with some good trainers, while the commercial gyms tend to be a bit cheaper. Looking at a website, qualifications and experience are all good, but getting a referral from a friend or someone in the know is even better! all these personal trainers are gonna teach you is the same what a trainer at a gym would guide you. they will just push you to your limits. Join a gym, work out and gain knowledge in the initial months. having a good gym partner is the key who is keen to get fit. he would help you to go beyond your limits and that has been the key for me, trust me. no need to waste your money on personal trainers. and have a diet plan setup by a good dietitian. Hit them up online, via Facebook or give them a call just to have a chat. Steve has been my PT for years and he helped me lose15kg in under 6 months and he gave me knowledge to have maintained my weight for over 2 years now. Try Nathan @ Definition Fitness, reasonably priced and knowledgable. Hi Orangegirl, My Name’s Nick and I’m a pretty great personal trainer. I work out of a gym called ACT Barbell in Fyshwick but I live in Braddon and can take you for sessions in the inner north area. I pride myself on setting up my clients with the skills and knowledge to be healthy and fit for their entire lives. If you were to train with me then we’d achieve whatever your immediate goals are while also servicing that overarching goal. We’d take a holistic approach towards improving your whole lifestyle, not just the time that you’re in the gym. It’ll be about using the best available knowledge to develop a system that works for you personally. My goal is to get my clients to the point were they’ll never need my services again. I charge $44 per session, which includes all the outside programming we’ll do for the rest of your week. If you have any health/fitness/nutrition questions or you’d like to organize a free trial session then please e-mail me at nickdelatovic@hotmail.com or call on 0423 535 369. Failing that, I can personally vouch for the knowledge and skill-base Ben at Elements. Very modest there Nick, can you help me with my immediate goals of deadlifting 400kg and running a 2:10 marathon? Nothing a few bicycle rides won’t fix. Reduce intake and increase output. Eat less and walk, run, swim, bike ride etc. No need to pay someone, self discipline is all that is needed. Make a set time everyday to do some exercise, and just reduce what you eat by a bit. Because all skinny people are fit, healthy and active….. yes the basic principle is eat better food (less is not always good) and get more exercise, but well lots of people do this get nowhere. There are plenty of normal weight people who are unfit, eat more junkfood than people who are overweight and exercise regularly. a) don’t understand what eating well actually means (just because it’s not “junk food” doesn’t mean it’s healthy eating!). They don’t understand basic nutrition and how your body processes what you put into it, or what the food they’re eating actually contains in terms of fats, protein, vitamins, carbohydrates, etc. b) don’t understand how to exercise properly or effectively. If you create a deficit between the energy you consume and the energy you expend, you’ll lose weight. It’s that simple. Not losing weight? You’re either eating the wrong food (or just too much food) or you aren’t exercising properly. Or both. Plus there is the mental side of it, i’m sure for all those professing the simple eat less, exercise more line, i could find something they can’t do simply. Besides however someone achieves this in their life is irrelevant and one liners usually do more harm than good. A personal trainer doesn’t let you give up, pushes you harder, keeps you motivated. I’ve had one for 2 years lost 30kgs and am far fitter and healthier than I was by a long way. Also family and friends often won’t push you as hard as you need to be pushed and they provide easy excuses. You’re right Bussie. I should have included the fact that the first week of sessions will include a full physical assessment, which will be used to formulate realistic goals. I always begin by focusing on movement patterns, strength balance and mobility. These are the most important aspects to lock down for years of injury-free progressive training. OrangeGirl obviously has the right attitude since she’s talking about training over a period of years. That said, my clients tend to exceed their own expectations by some distance in the initial 6-week period (sorry if that still sounds immodest). Intense Personal Training is the best I’ve come across. More suited to muscle building but they also do cardio as well. All true, but far too vague to be of any actual help. I’m a big believer in one’s ability to self-teach but sometimes it really does help having someone else teach you and share their insight, or even just show you where you’re going wrong. Because of Nick’s ridiculous claim that whatever someone’s immediate goals are he’ll help them achieve those goals. Helping someone reach their immediate goals is ridiculous because….? I’d also like to agree with Watto23’s comment. As an athlete myself, I’m very reliant on the knowledge and oversight of my Coach’s to make I keep progressing. Getting expert knowledge will help you in ANY pursuit. Anyone looking to become healthy who is decent financial means should avail themselves of coaches, psychologists, physiotherapists etc. Of course their are a thousand ways to be active, many of them free. But many Australians are short on basic knowledge that would make a real difference in their lives. For instance, how to strengthen and mobilize your lower back, or the concept of homeostasis (which explains why many people can’t lose weight just by going for a run). The best part of my job is getting to share this life-changing info. Seriously if its that simple we all would do it. OP don’t be afraid to try a few trainers out. Since I found a good personal trainer she is worth her weight in gold. My life and health have turned around completely. As someone whos always played sport and been a member of the gym, but also 30 kgs overweight, its easy to suggest to exercise more and eat less. A good personal trainer will help target the right exercise programs, also keep you motivated and also push your own limits. Most professional atheletes need a coach to help push them. Also if you mentally struggle see a psychologist also. This is far more useful than going on diets and doing fads etc. I’d recommend my trainer, but she is southside and has no spare places right now. Stay right away from a certain gym in Weston. One of their personal trainers is a psychotic, tattooed roid freak with a pathological hatred of “faggots”.